DIY Guitar Picks for #Fathersday « Adafruit Industries – Makers, hackers, artists, designers and engineers! If the Dad in your life has killer chops, then you should check out this tutorial from Heidi at happinessishomemade. 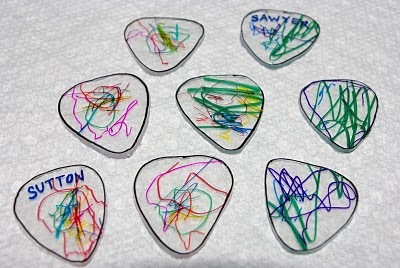 Even little ones can help contribute to crafting these awesome, homemade guitar picks for Dad! My boys are NUTS over guitar picks…don’t ask me why! 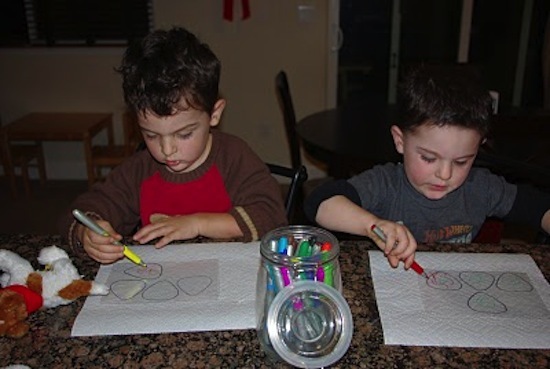 I decided to have them make their own special guitar picks instead of raiding their dad’s guitar case every five minutes (you’re welcome, Daddy!). * #6 plastic – this can be found in many food packaging materials including clear takeout containers. Our came in the form of disposable cake pan lids that we purchased at the Dollar Tree. Cut your plastic into a flat sheet and trace over your guitar pick template. My kids were too impatient, but at this point you might want to lightly sand the side that you are going to draw on as it makes the marker adhere better (without sanding, the marker will likely start to scratch off after awhile unless you are also planning on using a sealer on it). Start coloring!